Preferred Stock Investing, Third Edition is one of the most highly reader-rated books of any kind available for sale in the United States (Amazon 4.5 stars). To receive the free 2010 update to Preferred Stock Investing, Third Edition just follow the instructions on the first page of chapter 15 in the book. If you have yet to pick up your copy of Preferred Stock Investing, Third Edition you can do so at any of your favorite online retailers (see retailers | see reader reviews). Please pick up your copy today then follow the instructions on the first page of chapter 15 to download the free 2010 update. It's official. Section 171 of the Financial Reform Bill (officially known as the Wall Street Reform and Consumer Protection Act), signed into law on Wednesday, July 21, 2010, creates what is probably the single most significant opportunity for preferred stock investors in history. The opportunity for preferred stock investors is as unique as the sequence of extreme events that led to this new law and its provisions. Here is a list of the 22 highest rated, highest quality preferred stocks that will be the first to be affected by the new law (sorted by market price). This list updates and expands the similar list that I first presented to you last month. As you can see by the Effective Annual Return (EAR) column, the potential here for preferred stock investors is significant (trading symbols are provided to subscribers to the CDx3 Notification Service, my preferred stock email alert and research newsletter service). What makes this opportunity so significant for preferred stock investors is that Section 171, titled "Leverage And Risk-Based Capital Requirements" and authored by Senator Susan Collins, delivers the one ingredient that investors never have enough of; namely, advance knowledge. Now that the Act has been finalized, look over the below bullet list of what we now know about this opportunity and ask yourself how many investing opportunities have come along in your lifetime where you not only knew all of these things, but knew them in advance. The exact Effective Annual Return that you will earn on your investment. As a preferred stock researcher, I do not know of another such preferred stock investing opportunity in history. 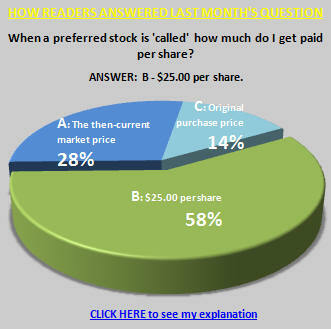 There are three types of preferred stocks - traditional preferred stock, trust preferred stock and third-party trust preferred stock (see chapter 2 of my book, Preferred Stock Investing, titled "Creating A New Preferred Stock"). Section 171 stipulates that our Big Banks (assets greater than $15 billion) will no longer be able to count trust preferred stocks (TRUPS) toward "Tier 1 Capital," one of the key values that regulators tally up when measuring a bank's reserves. That means that once this provision kicks in on January 1, 2013, many of our Big Bank's reserves are going to come up short. The simplest and most obvious way for a bank to return their Tier 1 Capital to the land of respectability would be to retire ("call") their TRUPS and replace them with new traditional preferred stock issues (traditional preferreds are still allowed to be counted toward Tier 1 Capital even though trust preferreds are not). That puts currently-trading TRUPS that are callable by January 1, 2013 directly in the cross-hairs. TRUPS that are callable by January 1, 2013 will be the first to be affected by the new law. When a new TRUPS is first introduced to the marketplace, its "call date" is published in the issue's prospectus. The call date is five years after the date of introduction. On the call date the bank regains the right to "call" (purchase back from you) your shares and, if they do so, they must pay you $25.00 per share regardless of your original purchase price and regardless of the then-current market price. So if you purchase your shares today for a market price less than $25.00 you position yourself for a nice capital gain in addition to the above-average dividend income that you will be earning in the meantime. have call dates prior to January 1, 2013. While we cannot say with certainty that these TRUPS will be called (that remains up to the bank), it is not clear why the issuing bank would not seek to do so since Section 171 removes the primary benefit of TRUPS to the bank (boosting Tier 1 Capital). The average annual dividend income from this list of 22 TRUPS, before we count any capital gain whatsoever, exceeds 7.2% right now. The resulting list that you see here is provided to subscribers to the CDx3 Notification Service. The far right column shows you how adding a capital gain after receiving two years of dividends pushes your Effective Annual Return up substantially. (Already a subscriber? Check out the CDx3 Discussion Group on the subscriber's website for symbols). Beginning this month, this Special Announcement article will present an update to the list of trust preferred stocks (TRUPS) that will be among the first affected by Section 171 of the Wall Street Reform and Consumer Protection Act, signed into law on Wednesday, July 21, 2010. Section 171 created the largest single opportunity for preferred stock investors in history. The window of opportunity will be open for two-plus years (January 1, 2013), but like most investments, the highest returns will tend to favor those who get in earlier rather than later. The new law disallows Big Banks (assets great than $15 billion) from counting their TRUPS in their "Tier 1 Capital" calculation, a measure regulators watch when assessing the adequacy of a bank's reserves. These Big Banks are therefore likely to retire ("call") their TRUPS and replace them with new traditional preferred stocks. Investors who hold shares of a TRUPS when it is called will receive $25.00 per share, so investors who purchase shares now for less than $25 position themselves for a capital gain on top of the above-average dividend income that they will be earning in the meantime. By looking at the far right column, you can see the effect that adding a capital gain onto the regular quarterly dividend income has on your Effective Annual Return...courtesy of the U.S. Government. Subscriber's to the CDx3 Notification Service (my preferred stock email alert and research newsletter service) are provided with an updated TRUPS list, including trading symbols, on page 7 of each monthly issue of the subscribers' newsletter, CDx3 Research Notes. Please consider becoming a subscriber to the CDx3 Notification Service today. W.R. Berkley is a $4 billion property and casualty insurance company established in 1967 and headquartered in Greenwich, Connecticut. It operates in five segments of the property casualty insurance business: Specialty lines of insurance, including excess and surplus lines, premises operations, professional liability and commercial automobile; Regional commercial property casualty insurance; Alternative markets, including workers' compensation and the management of self-insurance programs; Reinsurance, including treaty, facultative and Lloyd's business; and International (Australia, Hong Kong, South America, the United Kingdom and Continental Europe). 2009 was a light year for disasters which is both good news and bad news for insurance companies. On the upside, there are fewer losses to claims but on the downside, it is harder for insurers to justify rate increases which impairs revenue growth. 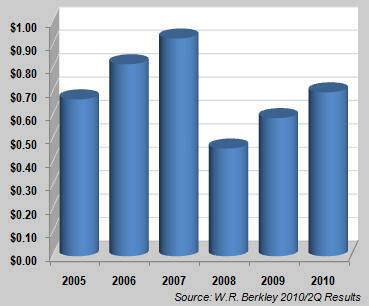 Comparing Berkley's second quarter results over the last several years, we can see how revenues have flattened out. Interestingly, second quarter earnings per share have risen significantly. This improvement is largely due to two specific factors. 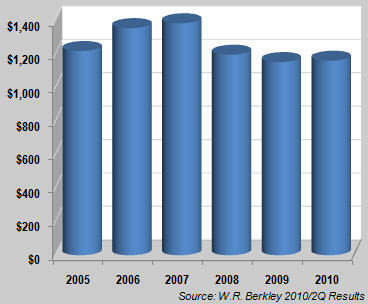 Since 2006 W.R. Berkley has added 19 new businesses, primarily through acquisitions. While it took a bit longer than expected to gain traction, these new units have started to produce results and are now adding to the company's bottom line. Secondly, like most insurance companies, W.R. Berkley collects cash in the form of policy premiums and invests it, primarily in fixed-maturity securities. Berkley's portfolio has benefited from the huge uptick that most investors have seen over the last year or so, resulting in a bit of a windfall for the company. "FinSecure enjoyed strong performance in its first full year of operation in 2009. Formed in 2008, it offers an array of highly specialized property casualty insurance products for the mortgage-lending industry and trust managers. Its complementary loss control services are specifically designed to protect its target clients against risks arising out of their core business operations and/or certain specialty services they provide. Over the course of its 18 months of operation, FinSecure has established itself as one of the leading markets in providing insurance to financial institutions for lender placed, foreclosed and trust properties, and is well situated to build on that foundation in 2010. FinSecure also quickly gained traction during 2009 with standard and specialty property casualty products in its niche, and anticipates another year of strong but disciplined growth, with an emphasis on significantly expanding its position in these lines." Launching FinSecure right into the teeth of the crisis was a risky move to be sure, but where others shied away W.R. Berkley saw opportunity and seized the moment. Learn more about W.R. Berkley: Company website | Profile | Upgrades/Downgrades | Recent News. Like last month's question, this question is particularly important since it is at the heart of the opportunity that Section 171 of the new Wall Street Reform and Consumer Protection Act creates for preferred stock investors. For the first five years of a preferred stock's life, the issuing company is required to continue paying you the dividends specified within the issue's prospectus. Even if prevailing dividend rates in the U.S. economy go down after the preferred stock shares are issued, the issuing company must continue to pay you your dividends as specified in the prospectus. But once the call date arrives, five years after introduction, the issuing company regains the right to purchase your shares back from you. Whether or not the issuing company calls a preferred stock issue is often determine by whether or not the company can save dividend expense by doing so. And the savings do not have to be as much as you might think. In fact, if the issuing company can save as little as .375% by issuing a new preferred stock at a lower dividend rate and use the proceeds to call an older, higher-paying issue, there is a 91% chance that they will do so (see Preferred Stock Investing, pages 217-218). Section 171 of the just-signed Wall Street Reform and Consumer Protection Act provides another reason that a company will call a preferred stock. As explained in the Last Month's CDx3 Investor Result article above, this section of the Act eliminates the primary reason that Big Banks issue, and continue to pay dividends on, trust preferred stocks (one of the three kinds of preferreds and the one that is most favored by banks). Starting January 1, 2013 Big Banks will no longer be allowed to count the value of their trust preferred stocks toward their "Tier 1 Capital," a measure of their reserve strength. 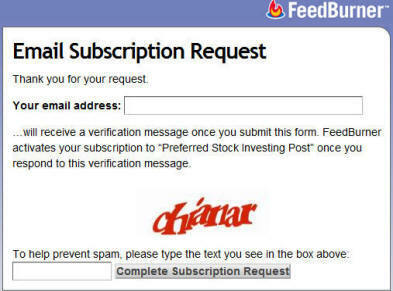 For a list of the targeted trust preferred stocks that are currently selling for less than $25 per share, please consider subscribing to the CDx3 Notification Service today. Whether or not our Big Banks redeem (call) their trust preferred stocks beginning in January 2013 is a decision left to the bank. But once the current provisions of Section 171 of the Wall Street Reform and Consumer Protection Act kick in, our Big Banks really have little choice but to do so since the primary benefit of having these securities (being able to count them toward Tier 1 Capital) goes away. "I'd like to note that the recent enactment of the [Act] may have an impact on the Tier 1 treatment of our approximately $3.5 billion of trust preferred securities and provides for a phase-in period expected to begin in 2013. Given the potential change in capital treatment of these securities, we anticipate that we will determine whether to exercise our rights to redeem our trust-preferred securities at or near the beginning of the phase-in period." Officials from publicly traded companies stay far, far away from statements involving future events during such investor conference calls. Here, Perlin is trying to put investors on notice while not saying anything too specific that cannot be wiggled out of later. But the message is clear enough. Another interesting point: during these investor conference calls, company officials read prepared remarks and then take questions from those on the call (mostly Wall Street analyst types). Mr. Perlin made this statement during his prepared statement before being asked about it. I am expecting near-identical statements to now be made by all of the Big Banks (assets greater than $15 billion) as they conduct investor meetings. This is a big issue for our Big Banks and, given the enormous opportunity it creates for preferred stock investors, one that I will continue to keep you informed about.